Get The Cold Light of Day from Amazon or read more articles on film and television. You too can earn money from writing articles by signing up for InfoBarrel. The Cold Light of Day stars Henry Cavill (Batman v Superman: Dawn of Justice, Man of Steel, The Man From U.N.C.L.E.) as Will, a business consultant who is on a trip to Spain to meet the rest of his family. Will stays on his family's yacht but when he returns to it after visiting the nearby town he discovers that his family has disappeared and the yacht is deserted. After Will informs the local police, it appears that they are in cahoots with the kidnappers - why is never made clear. He is rescued from them by his father Martin (Bruce Willis) who admits he actually works for the CIA, and doesn't do the consulting job Will thought he did. Father and son drive to Madrid to meet with an associate of Martin, where something happens to him and Will is left on his own. Credit: en.wikipedia.org/wiki/File:The_Cold_Light_of_Day.jpgHe is contacted by the kidnappers of his family; it seems they want the return of a briefcase, or Will's family will die. Will knows nothing about this briefcase - he has only just discovered that his father worked for the CIA after all and it appears that might not the only thing his father had been holding back on - and the kidnappers don't enlighten him as to what it is. Will is also met by a colleague of his father, Carrack (Sigourney Weaver, Chappie, Red Lights), who, although she says she can help him get his family back, does not seem entirely trustworthy. Or indeed actually interested in getting them back. Will spends the rest of the film being chased on foot and by car through the streets and buildings of Madrid with quite a lot of shooting going on at the same time. He meets a local woman, Lucia (Verónica Echegui), who helps him along the way. Will copes amazingly well with his situation as a fugitive being chased through a strange city where he doesn't speak the language by armed kidnappers and terrorists considering his total lack of relevant experience. He also has no problems with using a gun and shooting back at people as well as performing some death defying stunts. The plot often doesn't make a huge amount of sense, nor do the actual actions of the cast in many circumstances; some of the cast just randomly shoot people simply because they, the cast member, have a gun, and if you have a gun, you shoot people. Even if the person you shoot has absolutely no involvement in the rest of the plot, is running away and isn't armed. At the very least that's a waste of bullets that you need to shoot at the people who actually are shooting back at you; at worst it's also pretty senseless psychopathic behaviour. Others are perfectly willing to have a friendly chat after trying to kill each other. There are some decent actors but they aren't really utilised. 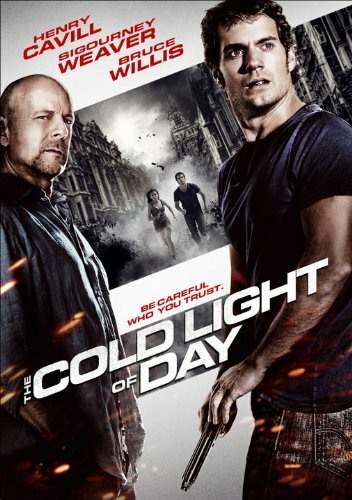 The Cold Light of Day is an adequate action thriller at best.